Find beading crafts, bead craft patterns and beaded craft project here. A wide variety of beads, like horn, ivory and wooden, are used for the purpose of making necklaces and earrings. The trend of making adornments with beads was first started by the Mochi tribe, but later on, women of other tribes initiated using beads in their thread work for dresses, bags and decor products. People of Gujarat and Rajasthan use colorful beads to create embroidery patterns. Gift items like wall hangings, box covers and vase decorations are also made by stringing the beads in patterns. A bead also enhances the aesthetic value of the craft. Beads are also used to make jewellery patterns. You can make use of beads to adorn accessories and make beautiful jewelry pieces at your home, on your own. Beading crafts range from simple craft projects, which require tacking single beads with glue or needle and thread, to the complex beaded craft patterns. Some of the popular beading crafts you can try are beaded bookmark, beaded lampshade beaded wreath, bridal shoes, Christmas star ornament, royal Easter eggs and safety pin bracelet. These crafts are long lasting and look so beautiful that they make perfect craft for teenagers and girls. Beads can be used to give a designer look to the plainest thing and makes the item look unique and special. It can also add festive touch to any holiday craft. 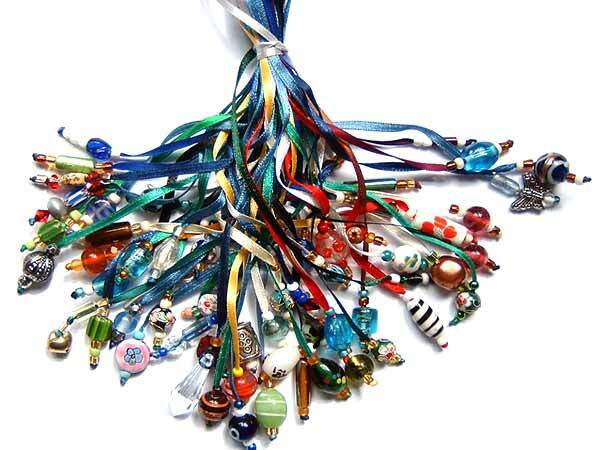 In this section, we have given some wonderful ideas for homemade bead crafts. Bookmark is a nice gift to bestow upon people who love reading books. Small though, bookmark can be a useful present for the reading lot. You might wonder how a simple bookmark can serve as a wonderful present. Simple! All you need to do is take a material that is otherwise not used to make bookmark, and try making a beautiful craft out of it. If you are going for a house warming party and are confused about what present to give, a beaded wreath would be one of the perfect options to go for. Though a bit more expensive than the other bead crafts, the wreath looks quite original as well as extremely beautiful. It can also be used for adorning your main door, during Christmas season. Every bride wants to look gorgeous, right from the head and down to the toe, on her wedding day. In this context, the shoe also plays an important and prime role. By completing her accessories, they make her look more beautiful. However, many-at-times, getting bridal shoes in exactly the same shade as the dress is simply not possible. Christmas Star is one of the most important and famous symbols of Christmas. You can find The Star of Christmas atop Christmas trees, cards, cribs and in homes and streets during the festive season. Besides being an ornament for decoration, it is also a symbol of hope and happiness. In case you are going to a party, but don't have the money to buy a gift, resorting to crafts is always the best option. One of the most inexpensive crafts comprises of a safety pin bracelet. Made mostly out of safety pins, it proves to be a very economical gift idea. Such bracelet is liked by kids, teen as well as ladies.